Tarot is not so simple that you can learn enough from a simple list of Tarot Card Reading Instructions to be able to get the most from your use of tarot decks. That is good news because the more there is to learn about any new subject the more sophisticated and generally worth your time it is likely to be. The following 20 Tarot card reading instructions is just a summary of the steps involved in a typical tarot reading. Choose a Tarot Deck that appeals to you and that you feel comfortable using. Arrange to have enough time in a peaceful space in which you will not be disturbed. Create a calm spiritual atmosphere. Some people like to use a special table cloth and/or enhance the mood with objects such as candles, crystals or flowers. At least try to clear sufficient physical space to lay out all of the cards that'll form a single reading. As a rough guide the area that would be occupied by 3 rows of 5 cards is a fair minimum for the types of short simple readings someone new to tarot might begin with. Consider which spread you will use for this particular reading. Choice of tarot spreads is a subject in its own right. Meditate or pray according to a system that feels right to you. Using whatever technique suits your personal philosophy, calm your mind into a suitably receptive state, emptying it (at least temporarily) of day-to-day worries, concerns and pressures. It is particularly useful not to feel any sense of time-pressure. Ideally this step should not take long or be obvious to others, though it is important. 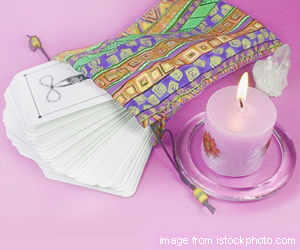 Handle the tarot deck respectfully and, when you are ready, shuffle the tarot cards. Bear in mind that, depending on the spread and the system you have chosen to use, the tarot cards may have different meanings depending on their orientation (upright, or reversed) so you may need to shuffle the cards in both respects. So, the person for whom the spread will be interpreted is now holding and lightly shuffling the deck while holding his or her question or subject in mind, with an open mind. Try not to hope for any specific outcome or advice at this stage - either in 'real life' or in the form of seeing specific cards in your reading. Just hold the issue or area of concern gently in your awareness and mentally ask for guidance or to be open to receive wisdom, or similar. Tarot readers may use their own particular rituals next, at the beginning of the reading itself. A popular choice is to split the deck into three sections, which is often called 'cutting the deck', or to invite the sitter to do so. Individual styles vary but there is usually some small, but significant, action marking an end to the phase of preparation and the beginning of the reading itself. If you cut the deck into three sections it is usual to then replace them in a different order, forming the final "shuffle" of the deck. Many readers re-form the deck in a particular way or order that may look impressive but, probably more importantly, helps to fix him or her into his or her best mental and emotional state for tarot reading. Now it is time to begin the tarot reading itself - or to layout the spread. Either lay-out the entire spread face-down before turning-over each card in order, or turn cards over as you place each. Some readers lay out all of the cards that will form the spread face-down on the table or cloth before turning-over the first card. Other readers lay the cards facing upwards and begin to "read" interpretations from placement of the first card that will form the overall spread. There is no "right" or "wrong" method but it is important to be consistent. As a general rule, cards are more likely to be laid-out face-down forming a full spread at the outset when there are more cards used in that particular spread, e.g. in the cases of 15 or more cards in the spread. However, it is always a matter of individual choice. We must make some assumptions to describe tarot card reading instructions in general, so we'll take the example of use of a 5-Card Spread for a tarot reading about a specific topic. See also a 5-Card Relationship Spread in the FREE relationship tarot reading section. Having decided if you will lay-out all the cards first or turn each over as you go, now be sure that you are clear about the spread you will use. If you don't know it well you might want to have the book you are using or other tarot card reading instructions to hand. We'll assume that you have laid all five cards face-down before starting to read by turning each card over in turn - that is, in numerical order as indicated above. Why ? Because if you are reading these tarot card reading instructions then you are probably just learning tarot reading so by laying all the cards out first you have already defined your spread (as a reminder in front of you) and you have now replaced the deck on the table so both hands are free for reading further instructions, including possibly (probably !?!) looking-up meanings in books or online, as you go. This simple page of tarot card reading instructions does not include a description of the meaning of every card in the deck, but you do need to understand the meaning of each tarot card when it appears in a reading - so open another tab in your web-browser and check the meaning of each individual tarot card as each one is revealed. Do not suppose that simply reading an interpretation is sufficient. Books and webpages only convey words which may evoke different emotions in different people at different times. Really look and "feel" each individual tarot card. How does the description make you feel ? How do the colours affect you ? Does it give you an overall sense of hope, or despair, etc.. If Tarot reading is new to you, you might decide to write down your responses, at least initially. That will probably take a bit more time to do, but it could prove helpful over the longer-term as you learn from your experieces of many readings. Having got an initial sense of the card itself, next consider the card in that particular position. If the reading is for someone else, NOW you can start to speak. Be sure to mention the significance of the card's position in the spread among your first remarks. For example, you don't want to talk for 5 mins about the Death card, only to add afterwards that it relates to the past; by then you might have disturbed the emotions of the sitter enough to disrupt and render less helpful the rest of the reading. So, you might begin by saying something like ... "This [Name of Tarot Card] in this [Meaning of Position in Spread] position in your reading about [subject of reading - if stated by then] gives me a sense of [your overall impression based on both the standard "meaning" of the card, your own "sense" at that time, and your intuition also taking into account the significance of the position in the particular spread] ..."
Remember that the Tarot is not absolute. At best it may offer helpful insights into possibilities. Do not say anything outright negative, either to yourself or to anyone else. You do not know enough to do that. Do not be frightened and do not say anything or behave in any way that might frighten anyone else. That is not the purpose of Tarot, neither is it a nice or constructive way to react in general. Continue to interpret each card in order. As you do so be sure to constantly review the previous cards in the light of new information revealed by subsequent cards in the spread. There is no need to state all of this consideration aloud, but do be consciously aware of it. Yes, that takes time. If you have had a tarot reading by a professional tarot reader then you might have noticed that tarot readers sometimes pause for a moment now and then. There is often a lot to take in and feel for balance of. When cards have been considered individually take a fresh look at the spread before you and consider it as a whole. Sometimes new insights emerge at this stage. It is, of course, essential to be patient. Mention any such new overall intuitions to the sitter if there is one. Observe his or her response to get a sense of whether or not your comment has been understood. If not, you might need to tune in again, take a bit more time, and possibly re-phrase any insights that present themselves to you. Next, if you have a sitter (other than yourself) invite his or her questions. Maintain an open mind and try to answer questions with reference to the cards. E.g. "[specific feature/detail] in [specific card] which is in the [meaning of position] in your spread gives me the sense of ...". Even if you know the spread that you are using extremely well, don't assume that the sitter has remembered everything you said about it as he or she will have been processing a lot of information during the reading so far, including of course his or her own emotions, of which you might not be fully aware. Sometimes an extra card or two is helpful. If you need to take an extra card from the deck after the end of a standard spread / reading don't start the shuffling process all over again. The deck has already received the energy of this question at the outset. Some readers invite the seeker to shuffle again briefly, others simply use the next card - after clarifying aloud the extra information required. If you choose to do this be sure to interpret the extra card/s in the context of all the information already present in the spread. Remember that, at this stage you are not starting again. Do not be tempted to change to a different interpretation of the spread at the end if or because the sitter hoped for a different outcome. If necessary explain that tarot does not predict the future because we can always affect future events by our own attitudes, actions and emotions. Remember that someone's fear of a situation is enough to affect a tarot spread - hence the reason for setting-up a calm positive environment in steps 2., 3. and 5. at the beginning of these tarot card reading instructions. At the close of the reading don't forget to consider how you feel. Obviously you might have some information about how the sitter (if any) feels, but that information will be limited. In some way energetically 'close' the reading, for yourself - not just by saying "Goodbye" to a sitter. Many readers find small rituals helpful at this stage. Read various books and websites and try out ideas in order to find or develop a good "closing ritual" to suit you. Respectfully re-pack your Tarot Deck and any other items used to create the ambiance for your tarot experience. - Article added 29 October 2010.